With the ability to buy almost anything you want or need from an 800 number or the internet, the day of the mediocre salesperson is dead. The 21st century customer is more demanding than ever and will only deal with people who are ready, willing, and able to add extra value to everything they sell. And it’s not just value … It’s quality, service, convenience, and value. Get ready for a dynamic program featuring award winning speaker, Warren Greshes. His inspiring stories and motivating philosophies help instill new levels of commitment towards excellence. 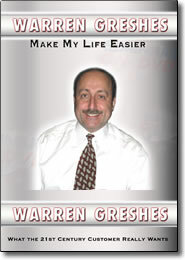 Warren Greshes delivers over 70 talks a year to corporations and associations throughout the world, and his energetic, no-holds-barred delivery keeps his audiences engaged and entertained. Provocative, witty, and outrageous, Warren is a favorite for keynote speeches and seminars alike.